While 3D prints of more popular Star Wars vehicles like the X-Wing and TIE Fighter are commonplace, quality projects based on less iconic machines are harder to come by. Thankfully one maker has come to Darth Maul’s aide and recreate his Bloodfin speeder. That maker is Brad Harris who created this print not only as a display piece, but as a model that would fit with the 1:12 scale (6 inch) figures for Episode I. To do this he tells us that the modelling was done in Blender over the course of around two weeks in his free time. As this vehicle would not stand on its own, a sandy base was created in ZBrush to keep it upright. 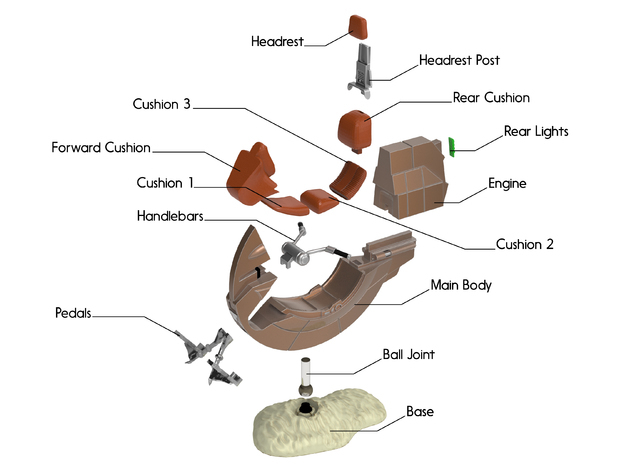 For references Harris used pictures of a Phantom Menace prop as well as the toys from the original product line. Printing of the final files should only take around 14 hours, though the completed one you see on this page took considerably longer than that as test prints were needed to ensure that the handlebars and pedals were in the exact right places. With the small ball joint that connects the speeder to the base, this print stands about 5 inches (12.7 centimetres) tall. The Bloodfin is 6 inches long and 2 inches wide (15.2 and 5 centimetres respectively). For finishing the raw plastic was sanded with 600 grit, some gaps were filled with Bondo and more sanding followed that. Painting here was achieved with a regular in the modelling world using Citadel’s range of base paints, dry paints and shades. 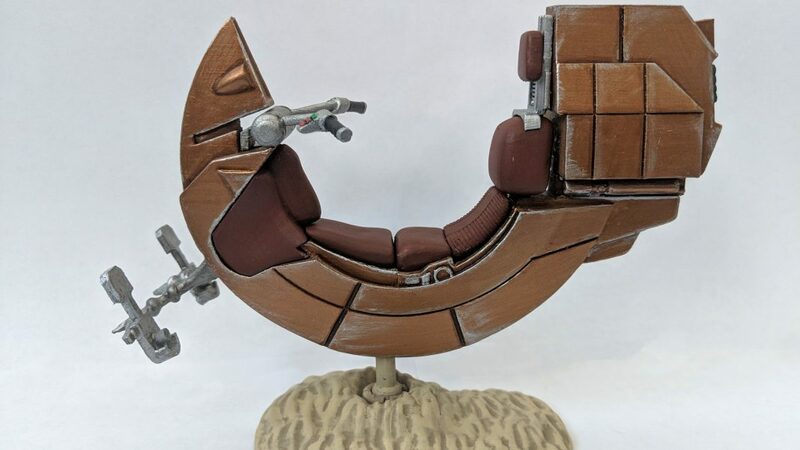 If you’d like to make your own version of this speeder, you can find the files to do so available for free over on Thingiverse. The pieces are sliced realistically to make painting a bit easier and for realism, but many supports are needed here. The files also come with a surprise in the form of an additional set of handlebars with allow Darth Maul’s lightsaber to be attached on either end. This is a homage to Star Wars: Demolition where the weapons could be used as such and, come on, who wouldn’t want to ride around on a floating bike with laser swords coming out of the handlebars?